I have hiked into and among these hills several times over the past two years. They are just east of the neighborhood where I live in north Phoenix and are a distinctive landscape feature that is visible for many miles. It wasn’t until last week when I posted the images of the Golden Poppies that I learned what “Tramonto” actually means…I had figured that it was the name of a place in Italy…given that the street names of the development are all related to Italy in some manner or another. But, thanks to Emilio at Disperser Tracks, I now understand that the word means “sunset,” and it is quite fitting, as the hills are often lit with a beautiful, golden hue during the last hour of a given day. It was a wet-enough Winter that the hills have come alive with the bright yellows and soft greens that are typical of early Spring in this part of the desert. In the above image, you can see multitudes of Brittlebush blossoms…a very common sight at this time of the year. Some people might say that it’s invasive, or maybe unnatural to exist as profusely as it does, but it brightens the roadside along the highways on this north end of town and makes it almost pleasurable to be out on those freeways…going…going…. I don’t know the names of the tiny white flowers above, or even the larger ones in the photo below, but they were tender treasures in the shaded slope of the hills that made me want to tarry long and forget about the rest of the ascent to the saddle and several minor summits that awaited me. But those little summits and saddles were my goal on this particular morning…I wanted to view the surrounding area from these specific places, as I had never been there before and didn’t know when I would get there again…so onward and upward I went. I had no delusions that I might escape the signs and trappings of civilization when I embarked on this hike…as I will admit that I do when venturing out on many other hiking excursions…I knew that I was essentially smack-dab in the middle of it, but I knew that the offered views would be wonderful. 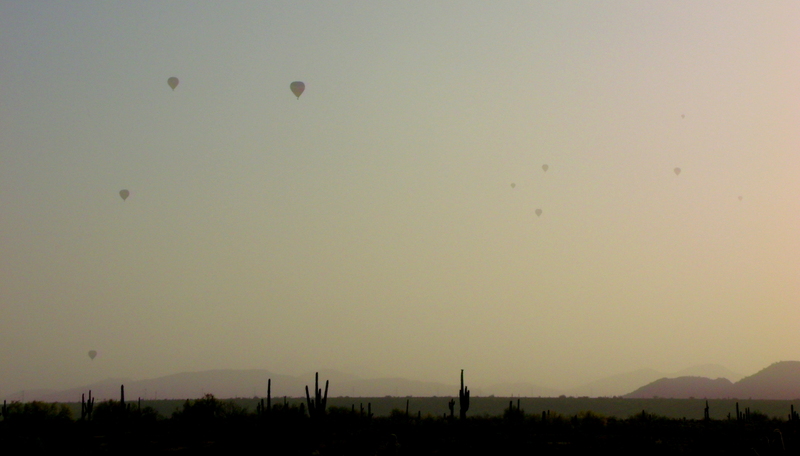 Looking a bit southwest in the above photo…and almost due west in the one below…the near ritual hot-air balloon rides were underway on this weekend morning…. …with the broad view above, where we can’t seem to escape the ubiquitous electrical poles and lines…with a bit of freeway thrown in for fun…. …and then the much closer view of examining Nature’s leavings on one of the few saddles along the way. Looking south from the same saddle…the desert hills…a stately Saguaro…Orange Globe Mallow in the foreground, and a bit of Brittlebush again with its yellow flowers. This one above is actually a photograph of the volcanic rocks…and the flowers kind of got in the way. It seems that the hills facing west are made of a type of crumbling granite and the hills just east and north of them are covered in various kinds of volcanic mess…some with the appearance of lava and others with the appearance of basalt…that provided a nice glass-like tinkling when they clanked into each other when moved under-foot. 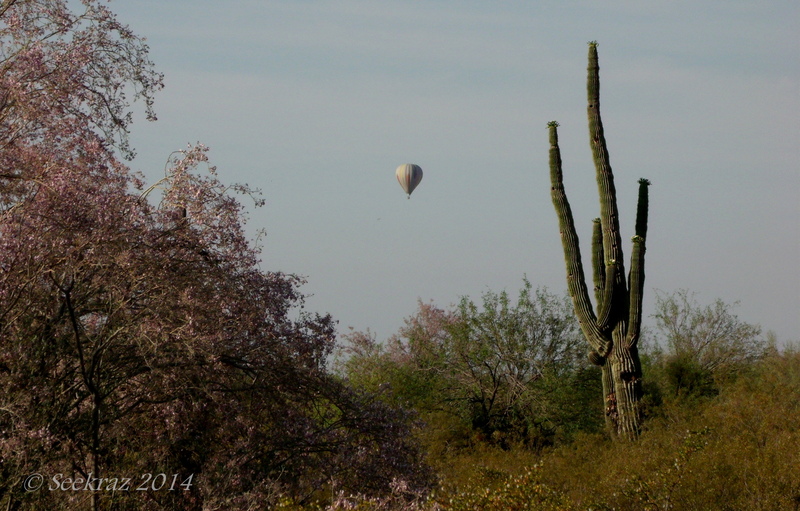 Yet another view of a solitary balloon…looking southeast now…over the desert plain…with the metropolitan “fog” in the air…. Far and near….near and far….and many fascinations do we find…sweet flowers and wild grass pollen or seed…. Who knew we’d be able to see Lake Pleasant from up there…but ahoy, there it is….west…and beyond the basalt-ed cairn…. And yet another cairn when looking north over Anthem and the prominent Gavilan Peak…. …and looking east, now, at the opposite side of the first cairn above…with the metro-mist and a balloon, to boot…. You’ve already seen the Golden Poppies, but I encountered them on the way down from the various saddles and summits…down in the deeper shadows of the volcanic ridge-line, waiting for the sun-shower that would soon be theirs…. While the below image was taken earlier than some of the previous photographs, it seemed like a nice way to end the post…so there it is…looking south and east from the first saddle with the various desert hills cloaked in what looks like a carpet of green….